Coming soon at Cape Lookout State Park… better habitat for fish! Cape Lookout State Park on the north Oregon coast is home to dramatic scenery and diverse wildlife habitats, containing everything from basaltic ocean cliffs, sand dunes, and majestic Sitka spruce forests. The park has an enviable location with facilities situated between the remarkable cape which juts 2 miles out into the Pacific Ocean and Netarts Bay, the latter of which is arguably one of the more pristine bays on the Oregon coast. 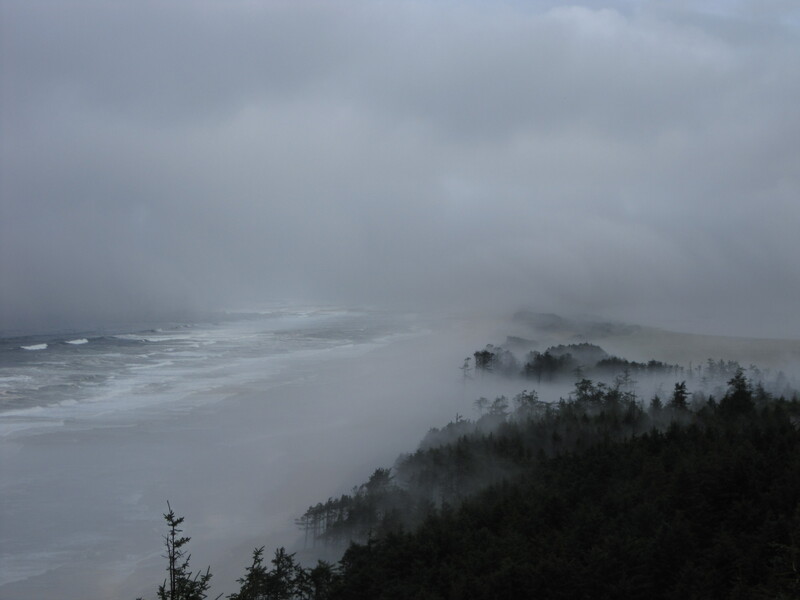 Looking south at Netarts Spit through a cloak of fog in Cape Lookout State Park. This summer, Cape Lookout has also been the host of a large stream restoration project designed to improve the park’s aquatic resources. Jackson Creek is an ocean tributary contained mostly within the park’s boundaries that flows through the picnic area before running out to the ocean on the cobble and sandy beaches just north of the headland. The Jackson Creek watershed encompasses just 1.6 square miles but provides excellent habitat for coho, sea run cut throat trout, winter steelhead, and many different species of amphibians. The upper part of the watershed is steep and Jackson Creek forms a deep, narrow canyon east of the Park. As the stream enters the Park, it enters the flat coastal plain, where the channel becomes less steep. 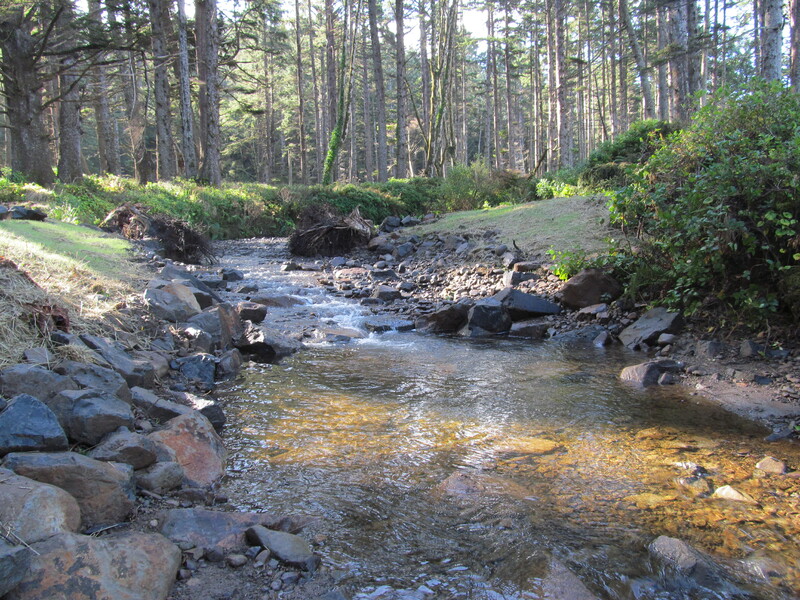 It is here, within the boundaries of Cape Lookout State Park, the creek provides important spawning and rearing habitat for fish. Jackson Creek has an interesting history and has long been impacted by a series of human caused disturbances that have resulted in its habitat being compromised. In 1950, the creek was diverted into an excavated channel and directed into Netarts Bay. According to an article in the April 9, 1950 issue of the Oregonian, this action was undertaken by Tillamook County with the hopes of improving the salmon fishery. It was also hoped by some that the increased fresh water into Netarts Bay would help clear out sedimentation and improve commercial oyster production. Jackson Creek was diverted into an excavated channel in 1950, shown here in this 2011 photo. The high sides of the channel keep the stream from interacting with a floodplain, reducing the quality of the fish habitat. These intentions were well meaning, but ended up having negative impacts on aquatic habitat. It turns out that Netarts Bay is naturally a very saline environment, with only 14 small perennial streams providing a source of fresh water to the bay. In fact, the bay flushes itself with only 1.6 tidal cycles which is pretty rapid for a bay of its size. The fresh water contribution from diverting Jackson into the bay was minimal. Also, the creek likely contributes more to sedimentation, particularly in the south side of the bay where it regularly delivers material from the steep slopes of the Tillamook Highlands. Diverting the creek into the bay also effectively cut off the ocean tributary from fish use. But this didn’t last long. A few years after the creek was diverted, it broke through the construction dam and some flows returned to the original channel. The flow of the creek has then been split between both channels- the historic ocean tributary and the newly constructed diversion channel- for the past 60 years. This had dramatic effects on the aquatic habitat. While fish have been using both channels, neither channel has had enough water in it to effectively support high quality fish habitat. Additionally, the diversion channel frequently went dry in the summer months and would strand juvenile salmon in small pools that eventually went completely dry. The diversion channel was also very unstable. It transported large amounts of coarse gravel downstream, and then would jump its banks and flow into portions of the campground. It wasn’t uncommon during these events to see juvenile salmon stranded in puddles in the campground! 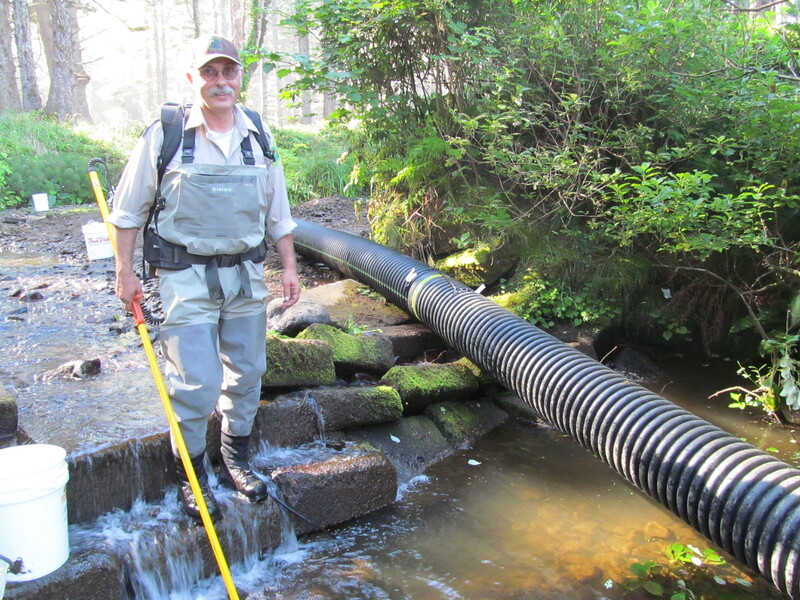 ODFW Biologist Troy Laws uses an electroshocker to salvage fish from Jackson Creek in early August 2013. Troy is standing here on the old road ford, which was a barrier to fish passage. Clearly, something had to be done. This summer, the Oregon Parks and Recreation Department teamed up with partners the U.S. Fish and Wildlife Service, Tillamook Estuaries Partnership, the Oregon Department of Fish and Wildlife, and the Oregon Watershed Enhancement Board to implement a large stream restoration project on Jackson Creek. As part of the project, the diversion channel was plugged and historic flows returned to the original Jackson Creek channel. A road ford, which had park vehicles driving across the creek to access the water treatment plant, was removed and a timber bridge will be installed to provide safe fish passage for all life cycles of salmon. And finally, the water intake that provides water from Jackson Creek to the park for use was effectively screened to prevent fish from becoming trapped in the park’s water system. With all these improvements, it is hoped that adult fish will have an easier time navigating the ocean tributary as they come in from the ocean to spawn. 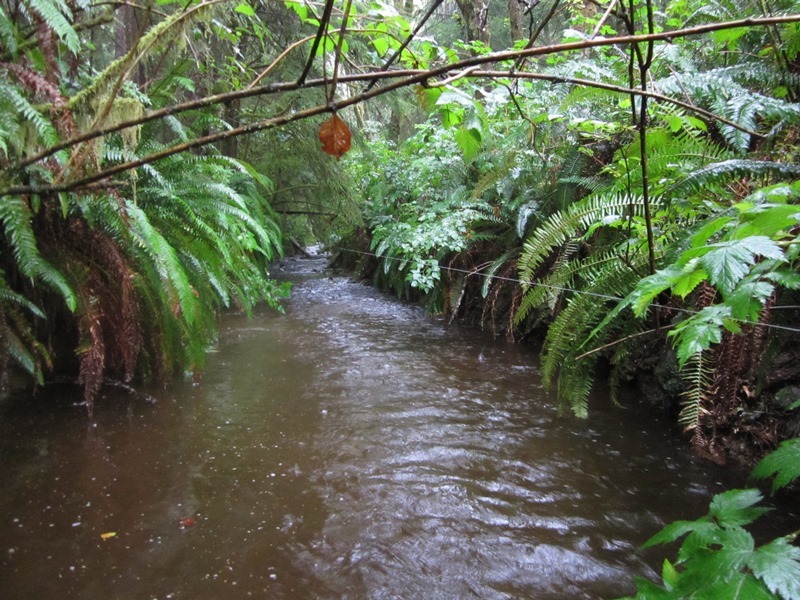 Natural resources staff also hope that the original Jackson Creek ocean tributary will become more connected to its floodplain with the increased flow, providing a better place for young coho to rear. All in all, the creek has been returned to its natural condition and will provide a better experience for all park visitors- both human and fish! Jackson Creek after restoration in early September 2013. This photo is looking upstream at the spot Troy was standing in the previous photo! Fish of all life stages can now easily move up and down stream.